For as long as I can remember, I've been baffled by the way the Hagadah chooses to recount the story of Passover. We read through the Four Questions, get to the section marked The Answer and ultimately read a set of cryptic verses that kind-of-sort-of tell the story of leaving Egypt. Sure, the imagery is powerful (Not through an angel and not through a seraph and not through a messenger, but [directly by] the Holy One, blessed be He!) and the themes of freedom and miracles are clearly on display. But why retell the story this way? What about all the juicy bits of the story that aren't included? Like baby Moses being floated down the river, or the burning bush, or the various encounters with Moses and Pharaoh. This is grade A material, why doesn't the Haggadah include it? This year, we finally connected all the dots at our seder, and it turns out the reasoning is actually quite simple. Heck, you're probably shaking your head right now at my lack of knowledge. But for anyone else who's been through the seder dozens of times and is curious why the story is told the way it is, read on. Exhibit A: Mishnah Pesachim. Mishnah Pesachim opens with a discussion about Chametz and quickly gets quite technical. The last chapter, chapter 10, contains a delightfully readable description of how our sages celebrated seder night. 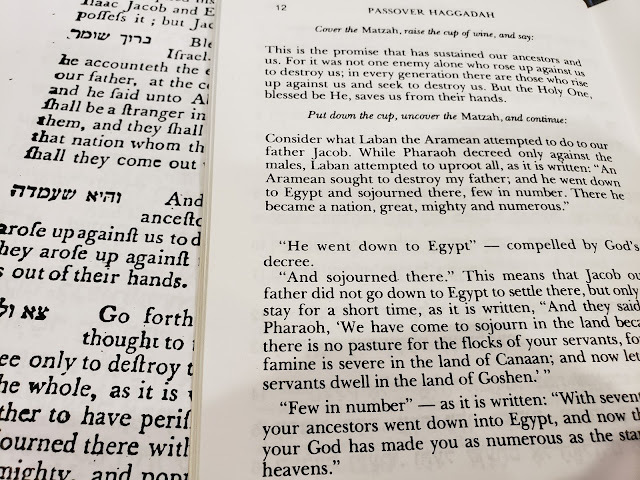 It's obvious that much of our modern Haggadah was informed by this Mishnah, and it does show a remarkable degree of continuity between our seder and those from nearly 2000 years ago. They pour a second cup [of wine] for him. And here the son questions his father. And if the son has insufficient understanding [to question], his father teaches him [to ask]: Why is this night different from all [other] nights? On all [other] nights, we eat leavened and unleavened bread, [but] on this night, [we eat] only unleavened bread. On all [other] nights, we eat all kinds of vegetables, [but] on this night, [we eat only] bitter herbs. On all [other] nights, we eat meat roasted, stewed or boiled, [but] on this night, [we eat] only roasted [meat]. On all [other] nights, we dip [vegetables] once, [but] on this night, we dip [vegetables] twice. And according to the son's intelligence, his father instructs him. He begins [answering the questions] with [the account of Israel’s] shame and concludes with [Israel’s] glory, and expounds from “My father was a wandering Aramean” until he completes the whole passage. Again, this is almost an exact match to what we did last Friday night. We poured the second glass of wine, read the four questions and then we got into the story. In the Mishnah, we're told to expounded from "My father was a wandering Aramean"... which means, what? Deuteronomy, chapter 26, describes the first fruits ceremony, which includes a declaration. The declaration is a pithy explanation as to how the farmer ended up with his bounty. It's also the exact text we read on seder night! The seder ceremony more or less follows Mishnah Pesachim, Chapter 10. Which says that the way to tell the story on Passover night is to take Deuteronomy 26 and expound on it. Which is exactly what we do, picking each verse apart and enhancing it. The story in the Haggadah may not recount the story of the exodus as I might have guessed, but it's most certainly not random. In just a few verses, Deuteronomy 26 summarizes the entire experience of leaving Egypt.